In a move which caught Goa by surprise on the first day of 2019, ailing Chief Minister Manohar Parrikar today visited the state Secretariat for the first time in months, where he was welcomed by ministers, party lawmakers and several BJP workers. 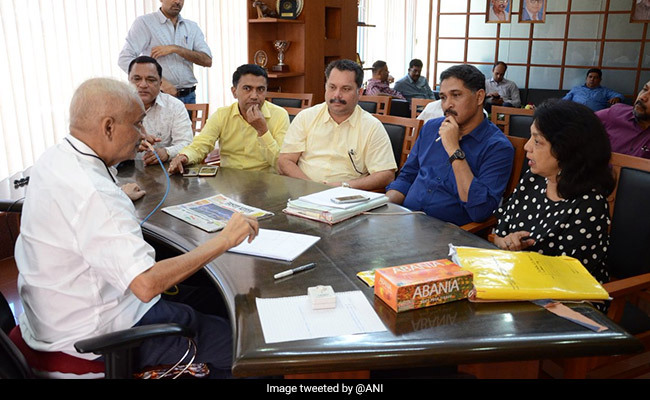 This is the 63-year-old Chief Minister's second appearance in public in the last few months, since his visit to an under-construction bridge near Panaji last month, but his first visit to the Secretariat, since his return from Delhi's All India Institute of Medical Sciences (AIIMS) in October last year. In a trademark half-sleeve shirt, Mr Parrikar, wearing medical paraphernelia -- a nasogastrict tube running from the nasal passage into the stomach -- was helped up the stairs of the Secretariat by his aides, in the presence of Speaker Pramod Sawant and other BJP leaders, including the party's state general secretary Sadanand Shet Tanavde. Mr Tanavade told IANS that the visit will boost the enthusiasm of Goa BJP cadre as well as the people of Goa. "This is a good development. Seeing our Chief Minister will boost our cadre," Mr Tanavade said. Mr Parrikar is suffering from advanced pancreatic cancer and has been in and out of hospitals in Goa, Mumbai, New York and Delhi since February 2018. Over the last few months, the Opposition has been demanding his resignation, claiming that the administration had come to a standstill due to his prolonged absence from office, on account of his illness.